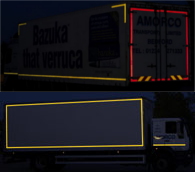 Vehicle Safety Markings required under ECE104 are 50mm to 60mm of highly reflective material that are applied to HGVs and trailers to increase their visibility. 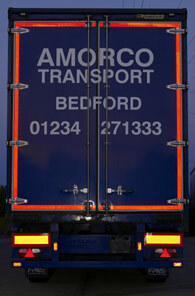 They clearly outline the rear and sides of the vehicle, making it visible at up to 1000 metres at night. 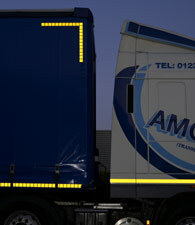 This means a HGV may be seen by motorway drivers up to 8-9 seconds earlier than those without vehicle safety markings. REAR: A complete contour line marking (box) needs to be applied if the rear of the vehicle is wider than 2100mm. 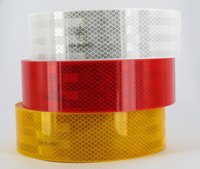 Red and yellow marking tape can be used on the rear, however the DfT states that the UK preference is red. The conspicuity marking should be as close as practicable to the edge of the vehicle and should equate to at least 80% of the overall width of the vehicle. SIDES: There are two options to choose from, a complete contour line marking or a partial contour marking, see image below. Partial contour markings are the minimum requirement. 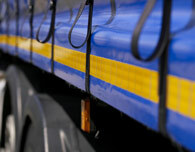 Yellow and white marking tape can be used on the sides, however the DfT states that the UK preference is yellow. If it can be proved to the satisfaction of the authority responsible for type approval that it is impossible to achieve 80%, the cumulative length may be reduced to 60%. Why apply vehicle safety markings in accordance to regulation ECE104? To meet the regulatory requirements under ECE104.